“The Passion Tree” tells the greatest story ever told. God’s Word never ends. His story never ends. And we are part of His story! There are a lot of hidden pictures and symbolism to find. See how many you can answer. Why is the tree so large in comparison to the people? Why is the garland red? 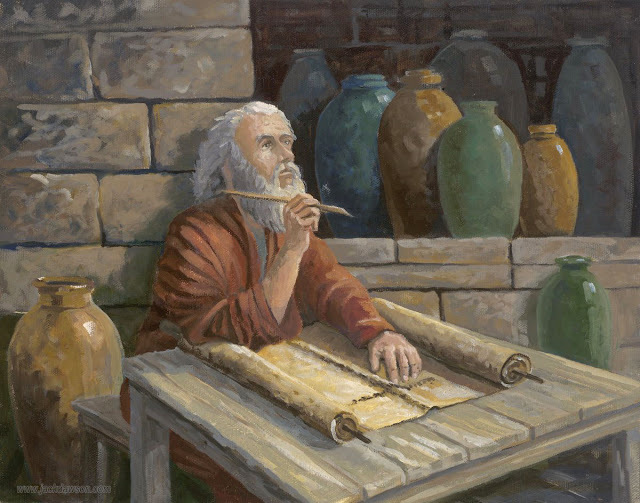 How many events are depicted from the Old Testament and the New Testament? How many lights are on the star at the top of the tree? Why that number? Is there something strange about the crown of thorns at the top of the tree? Why would there be a Golden Crown at the top of the tree? Look at the red ornaments on the tree. What do they form? How many candles are on the tree? Why that number? Can you see a suggestion of Christ in each flame? What could that symbolize? Can you find the map of the world? Can you find the reference “John 3:16” hidden in the stars? God and Father, thank You for loving us and wanting us to know You. Thank You for sending Your Son, Jesus, to give us the way. What a gift! We give gifts to each other today because we want to show our love. How sad we would be if we went to all the trouble of giving a gift to someone and they wouldn’t even take it! 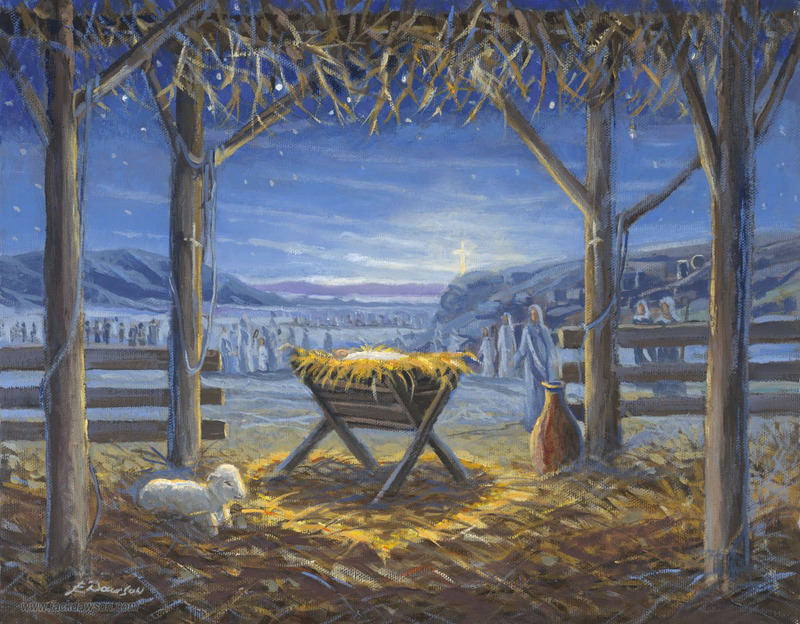 Christmas Day shows You have given us the greatest gift of forgiveness and everlasting life. Thank You for Your gift, Jesus! Each day of the calendar is a bigger picture of an ornament on “The Passion Tree.” Both tell the story of God’s plan for the world from Genesis to Revelation. Have the children locate their favorite event depicted on the Passion Tree and talk about one thing they learned about that story. #1 - The Tree - The tree represents the entire message. You’ll notice the tree is scaled much too large for the landscape. This is to illustrate the incomprehensible dimensions of God’s Word and His Plan for us. #2 - The Red Garland - The red garland that is woven throughout the tree never ends. It connects the ornaments and candles and represents what some have called “the crimson thread.” It symbolizes the blood of Christ. His life is woven through all history from eternity past to eternity future. 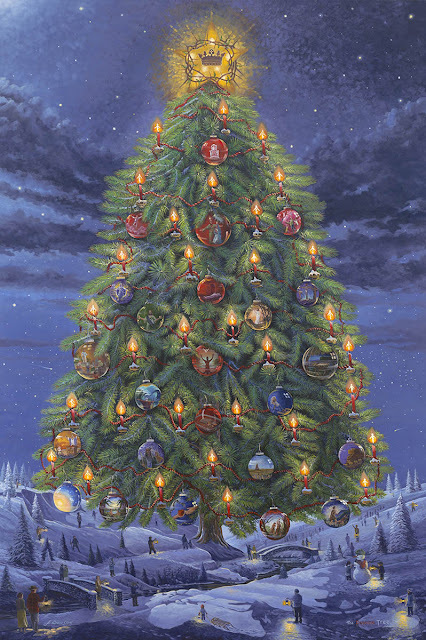 #3 - The Story - The story begins in the paintings of the ornaments, starting at the lower left on the tree and chronologically follows the crimson garland coursing to the topper. There are 12 ornaments that show events in the Old Testament and 12 ornaments that illustrate events in the New Testament. #4 - The Crowns and Star - The red garland continues past the last ornament into the crown of thorns, which is now budding with life because Jesus is alive! At the top of the tree you’ll see a star representing the glory of God. The seven lights remind us of the perfection of God and His seven-fold nature. In the center of the crown of thorns there is a majestic crown that conveys the confident truth that Jesus is coming again and will reign, as KING OF KINGS and LORD OF LORDS, forever and ever. #6 - 33 Candles - There are 33 candles. Jesus was born and walked on earth for 33 years in the form of a man. You can see an image of Christ in each flame, which illustrates the fact that in this dark world, He is the only true Light. #7 - Map of the World - There are some people under the tree carrying the Light to others who are walking in darkness. The snow-covered landscape suggests a map of the entire globe because this Message is for every person on the face of the earth. #8 - John 3:16 - The reference is found in the stars next to the Baby Jesus ornament. God loves you and has prepared a way for you to live with Him in heaven! 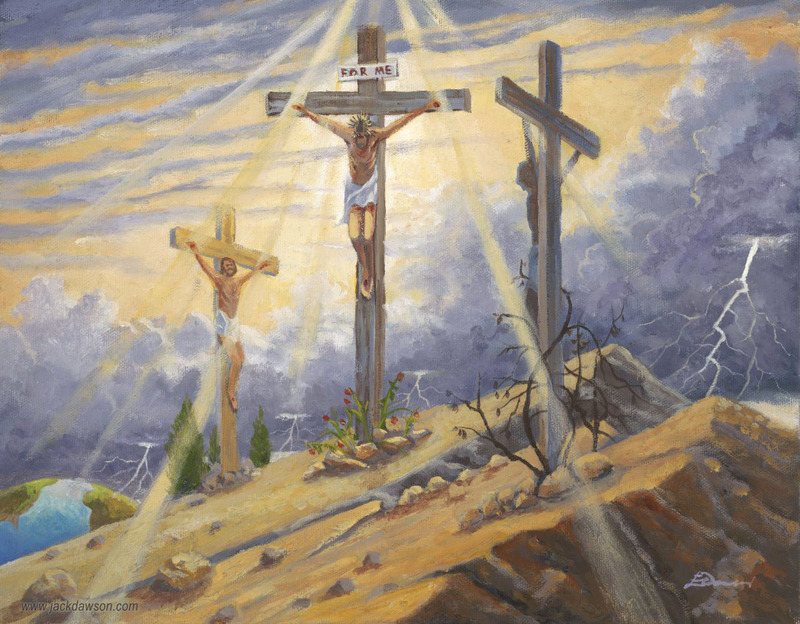 Thank You, God, for doing so much to keep us from having to die for our sins. Calvary’s cross, where You had to take on every sin of the world, must have been even more horrible than the lake of fire could be for us. Thank You for loving us so much. We give You our praise, Jesus, as our Christmas gift to You. Tell the children you are going to have a time of praise and thanksgiving for God’s plan to save us. Ask each one to choose a song that praises Him. Then lead them in a time of prayer, encouraging each one to tell Him at least one thing for which they are thankful. Lord, You tell us Jesus will come back when we aren’t expecting Him. When He comes, we’ll probably be living like any other day. Please help us to watch faithfully for You, so we aren’t taken by surprise. Please help us be ready to welcome You with great joy. 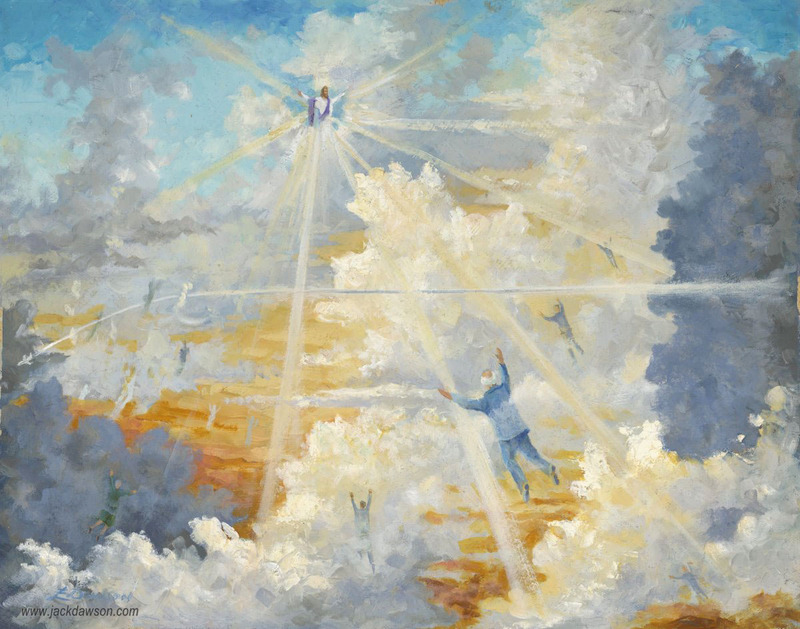 Ask the children what they think they will do on their first day in Heaven. Have them draw a picture of it. Can you find the dove in the painting? What do you think the empty jugs represent? Before Jesus went back to Heaven, He told His disciples to wait because He was going to send them a gift called the Holy Spirit of God. 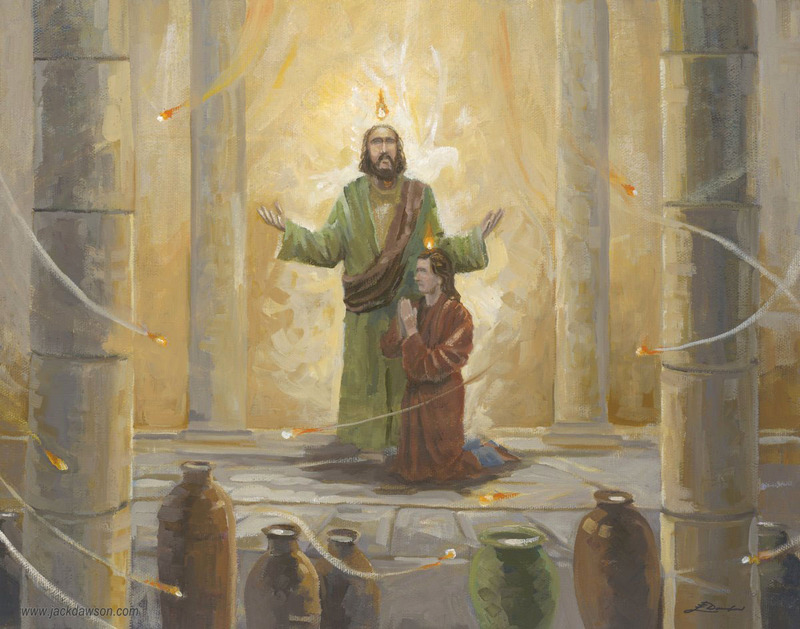 They obeyed Him and waited, and 50 days later on the day of Pentecost, they were all filled with the Holy Spirit. Because of the great power they received they would never be the same. Today, everyone who believes in Jesus has the same Holy Spirit living in them. Because of what God did at Pentecost, we have His power. Jesus told them that the Holy Spirit would give them power to be His witnesses in Jerusalem and Judea and Samaria and to the ends of the earth. Do you know what a witness is? When the Holy Spirit filled the believers at Pentecost, they began to think like Christ… and walk like Christ… and understand things they couldn’t understand before. They had become Christians, God’s children. Do you have the mind of Christ? Are you walking in the power of the Holy Spirit, like Christ? Are you a Christian? Lord, it is awesome to read how You sent the Holy Spirit on the Day of Pentecost in a sound to wake them up, a wind to make them move, a fire that would shine for the world to see, and tongues that would make them speak. Please keep us awake to hear Your Word. Help us move when You tell us to “go,” and use our tongues for You. Change our lives so we walk like Jesus. Shine Your light through us and fill our hearts with fire to share Your Good News. Read Acts 2:1-13. Present each child a beautifully gift-wrapped night light that represents the Holy Spirit. Discuss how its light can remind them of the light of truth God’s Holy Spirit brings to believers. Talk about why Jesus told His disciples to “be His witnesses in Jerusalem and Judea and Samaria and to the ends of the earth,” and remind them of His Great Commission (day 15). The dove is right behind the standing believer. It represents the coming of the Holy Spirit. Flames of fire are also a sign of the Holy Spirit. Empty vessels (jugs) sit at the front of the room like the believers waiting to be filled. What is happening is this painting? Do you know where this is taking place? Can you find something in the painting that will help you find out? Lord, thank You for showing us that this life is only the beginning of what You have planned for us. Thank You for such clear words and pictures about life after death. Lord Jesus, You stepped from this world we can see into the real world we can’t see to get our place there ready. Because of what You did for us, some day we really will be able to see You face to face, and live with You forever. 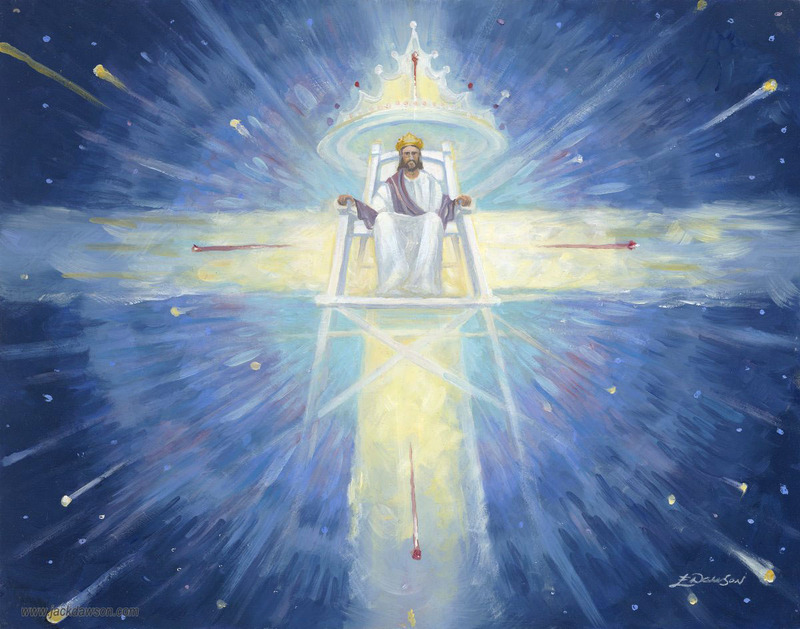 Jesus is rising into Heaven. 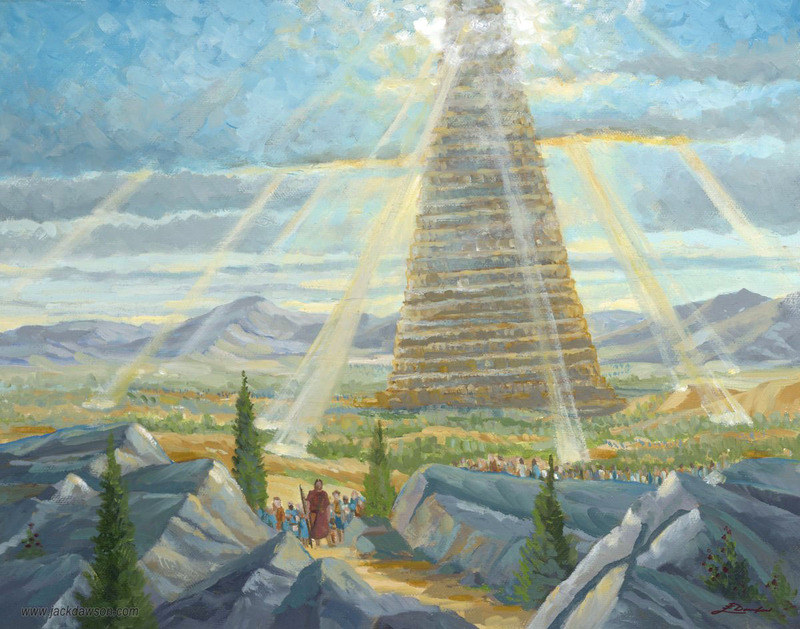 Scripture tells us He is rising from the mountain just outside Jerusalem. The top of the globe is seen and it appears that Christ is rising from the area of the Israel. 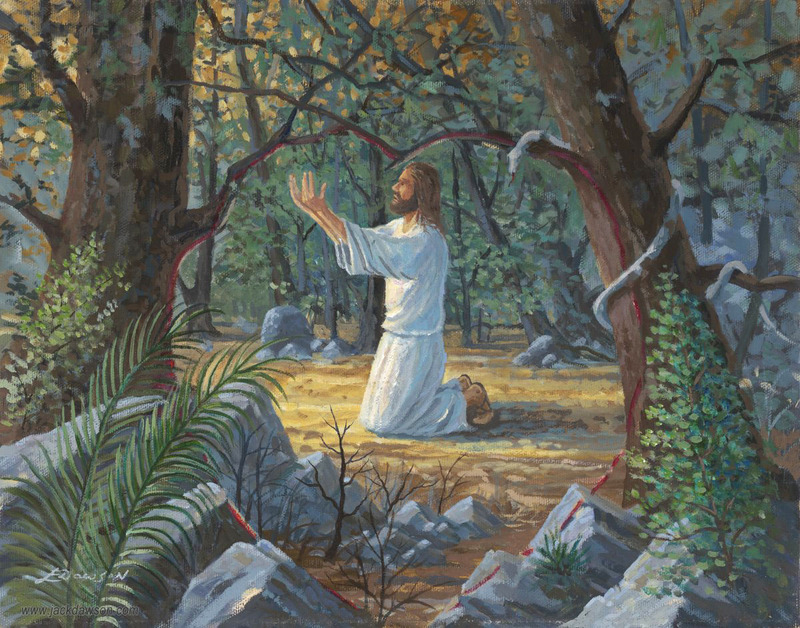 What is Jesus doing in this painting? What is He holding in His hands? Can you see something that lets us know how much God loves Him? Lord, sometimes it seems like the world is winning, just like it did to the disciples when Jesus was crucified. Please help us always remember You did exactly what You told us You would do. You overcame the world. You conquered death. And You give us Your power to win if we trust You. Teach us to praise You as Lord. Think of someone you knew who died and was a Christian. What did this person do while they were on earth to show that they were a Christian? If you are a believer, you have a great promise from God that you will see them again. Discuss things that this person could be doing right now in Heaven. Ephesians 3:21 says that the Lord is able to do more than we can imagine. So let your imaginations go! Have the children go online or search a good Bible concordance, find as many Scriptures as they can that refer to Jesus as “Rock, or Stone,” and read and discuss them. Have the younger children draw a picture of Jesus defeating Satan. Can you find what symbolizes the great battle between Satan and God? Where is the sign that tells us who the battle was all about? Jesus was the Son of God. But He didn’t resist when men came to arrest Him on false charges. He could have called angels to strike them down, but instead He let them beat him and lie about Him. He didn’t argue when they sentenced Him to die in a cruel and shameful way because He knew that was why He agreed to come to earth and become like us. It was God’s plan all along. The Bible says, “The payment for sin is death.” But since we are all so sinful, just dying for our sins could never pay enough. Only God’s perfect Son was good enough to do that. When Jesus said, “It is finished!” on the cross, He was giving every one of us the chance to begin again as His follower. Are you choosing to follow Jesus? Lord, I can’t really imagine everything You were willing to go through for me. Thank You that You always had a plan to save me from my sins, even though You knew every bad thing I would ever do. Please help me always remember that You paid the highest price so I could be with You forever. Please help me always make You Lord of my life. Have the children memorize John 3:16, “For God so loved the world that He gave His One and only Son, that whoever believes in Him should not perish but have everlasting life.” Now help them make a poster to hang in their room that says, “For God so loved (child’s name) that He gave His One and only Son, so when (child’s name) believes on Him, (he/she) will never die, but have everlasting life.” John 3:16. Talk about “the plan of salvation” and help them understand “believing on Him” means also repenting of their sins and accepting Him as Lord of their lives. Lord Jesus, thank You for loving me so much that You would die for all my sins and mistakes. Thank You that You didn’t give up when it was so hard. Please help me choose what You want when things are hard instead of my own way. Please help me always remember how much You love me, and be thankful. Tell the children about a hard thing God helped you through when you prayed. Ask them to draw a picture of the hardest thing they’ve asked God to help them with. Then ask them to draw a picture of His answer. Be prepared to discuss why we should praise Him in everything. 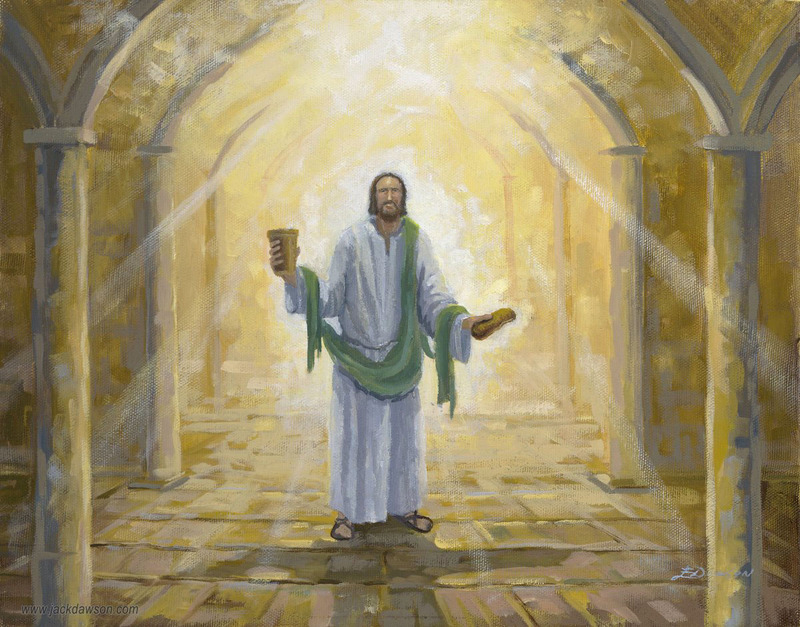 Jesus stands before an endless corridor with the cup and the bread, that are signs of His sacrifice for us. 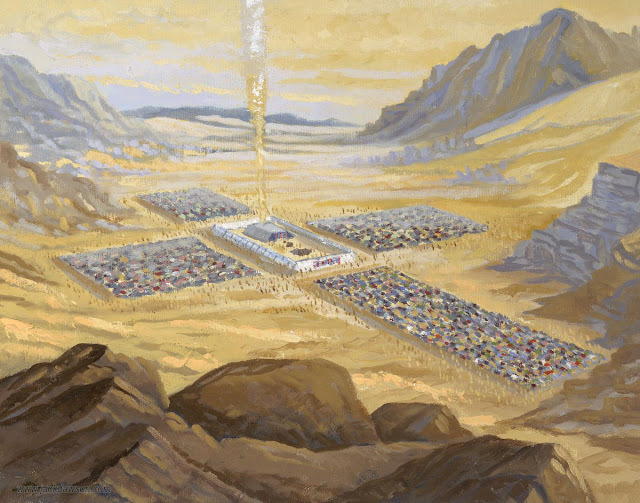 Can you find the cross in this painting? Lord, each time we have the Lord’s Supper, I promise to take time to think about what I need to admit to You as sin and change. Thank You that You are always faithful to forgive me and make me clean. Please help me always remember that You gave Your life so my sins could be forgiven. Have the children draw a picture of the last communion they attended at church and how it was done. Talk with them about what communion means to each of them. Perhaps schedule a time to talk to your pastor about why we observe communion. 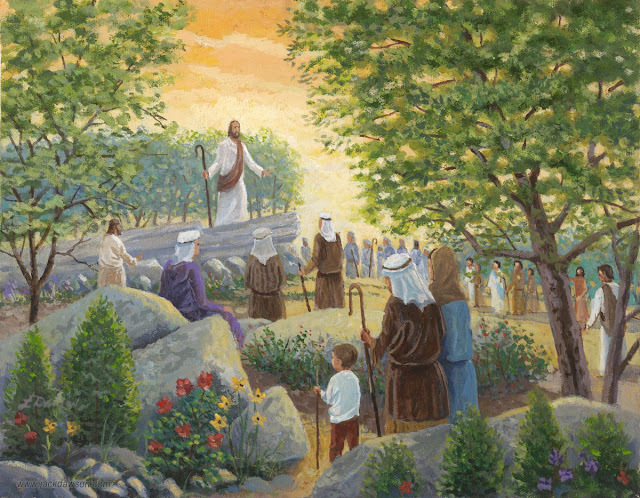 Jesus is preaching to the people, but do you see something strange in the painting? Lord, thank You for teaching us to live like You and tell people about You. Please help me watch for ways I can talk about my faith with everyone I meet, and use me to help them know You better. Use me in a new and wonderful way this week. Help the children list as many miracles of Jesus as they can think of. Have them draw something that reminds them of the miracle they like best and tell why. 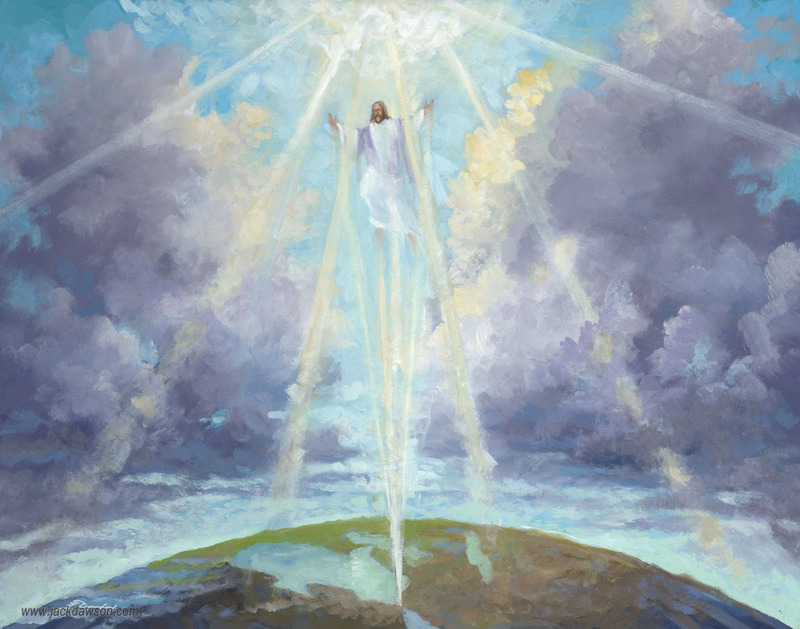 In this painting, what reminds us Jesus is the Light of the World? What represents the Holy Spirit? Where is He? Jesus grew up just like any other boy. For thirty years He lived in Nazareth, working in His family’s carpenter shop. But He always knew the world was waiting for Him to show the great love of God through His life and sacrifice for our sins. 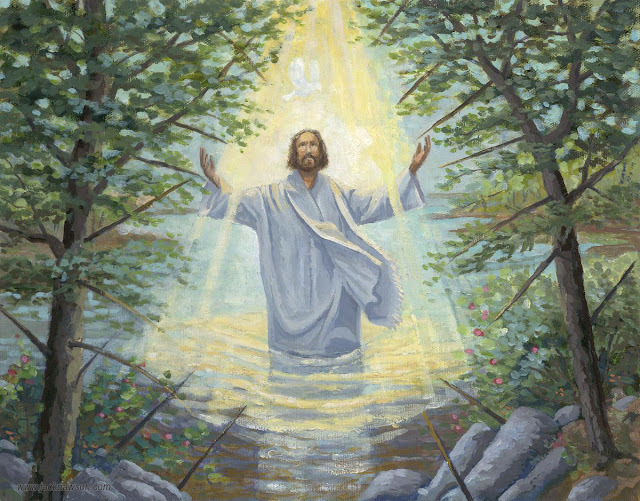 When God the Son was baptized we could see the Trinity: God the Father saying from heaven that He was pleased with His Son, and God the Spirit coming down like a dove to sit on His shoulder. 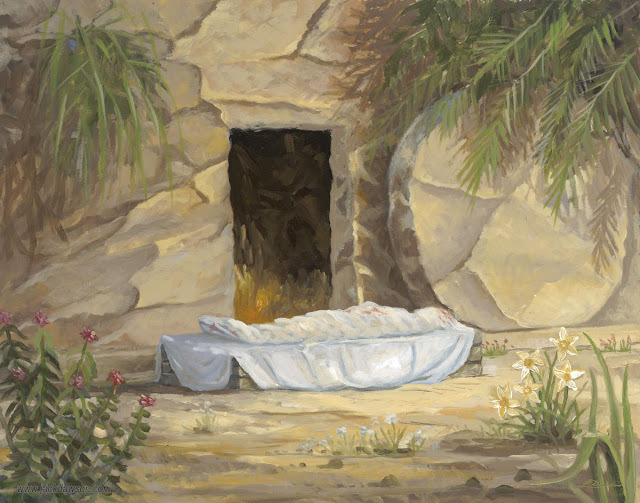 The Bible says it was a picture of His coming death, burial and resurrection; and to show He was ready to begin His ministry and work. Some say it was an example of what we should do. God has a special ministry for each of us. 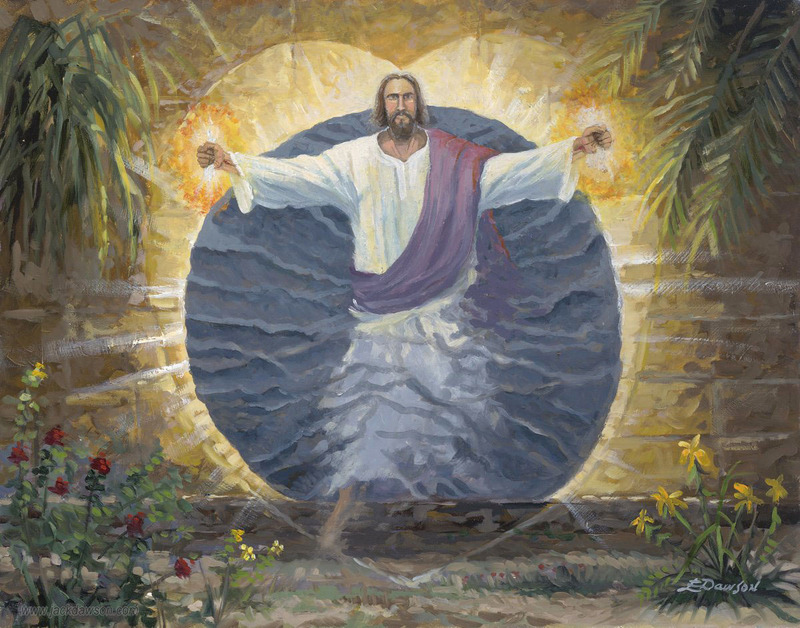 When we accept Him as our personal Savior, we should be baptized and follow that example to begin the work He has for us to do. Are you asking God to show you what He wants you to do and then doing it the best you can? Have the children read I Peter 2:38-39 and discuss what baptism represents. Have them draw a picture of their own (past or future) baptism and talk about what it means to them. Light shines down on Jesus at His baptism to remind us Jesus is the Light of the World. The Holy Spirit can be seen as a dove coming down to settle on Him. Lord God, thank You for sending Your only Son to live among us so we could know You. Lord Jesus, thank You for being Immanuel, “God with us,” and coming to earth to save us. Thank You for sending Your Holy Spirit to live in our hearts. Lord, thank You for telling us about the Old Testament prophets, who waited and believed You would send the Messiah just like You promised. Thank You that Jesus came, and He will keep His promise to come again for everyone who believes in Him. Please live in me and keep my heart clean for You. Thank You for forgiving me of all my sins. Have the children help build a cross from 2 x 4 boards or strong cardboard and place in the yard. Or, have them draw a picture of a cross to place in the front window. Father, I know the greatest commandment is to love You with all my heart and soul and mind. Thank You that because of Jesus we can come right to You whenever we choose, instead of waiting for a priest to come for us only once a year. We’re so thankful You live in everyone who accepts Jesus as Lord, instead of behind a curtain in the Holy of Holies, the way it was before He came. God told Moses exactly where the Israelites were to set up their camp. Do you think it could have been in the shape of a cross? Draw 5 rectangles on your paper like in the painting above. Lord, sometimes it seems like there are things to be afraid of all around. I believe Your promise that “greater is He that is in you than he that is in the world.” Please help me see Your power and remember You are stronger than anything I can be afraid of. Tell your children how God saved Moses when he was a baby and prepared him to lead the people while he was growing up as a son of Pharaoh’s daughter. Have them pretend to be Moses and see how long they can hold their arm up like Moses did over the waters. Have them list as many plagues as they can find in Exodus 7-11. Can you find the cross? God has warned that sin and wrong choices will bring His terrible judgement once again. The good news is, God has always had a plan to save us from our sins through the cross of Jesus Christ. Sadly, as Noah’s family grew and spread over the earth, mankind forgot all that had happened. 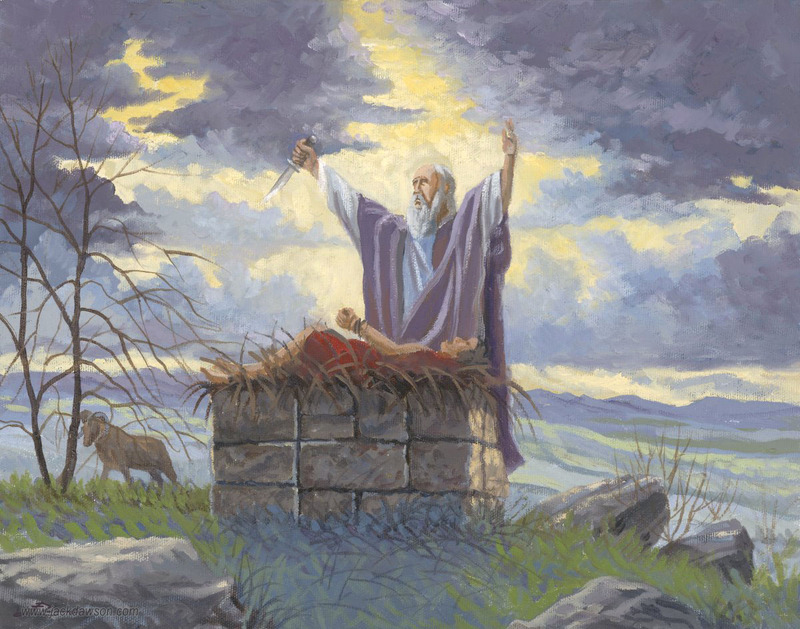 Do you think people today are a lot like people in Noah’s day? God planned for them to form many nations that would follow Him, but they wanted to make themselves great instead. They all chose to settle in the same place and started building a great tower that would reach to the skies. They wanted a great monument to their greatness. Instead, God confused their languages so they couldn’t understand each other, and scattered them all over the world. Do you think people today are still trying to build monuments to their greatness? Lord, forgive us when we forget we can’t live without You. You are the only giver of life. Thank You for loving us so much You’ll do whatever it takes to bring us back to You. The cross is on the large boulder on the path ahead of the people. Thank You God, for keeping Your promises; and for loving us so much. You always make a way for us to be saved. Please help us to always praise You for Your goodness, and whenever we see a rainbow, help us remember all You’ve done for us. 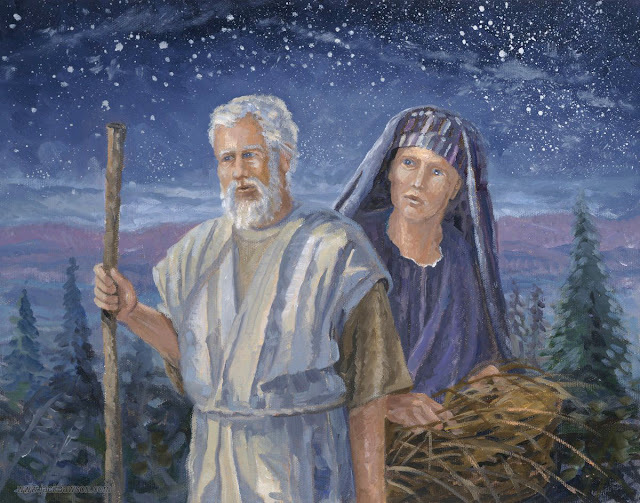 Have the children work together on a poster showing Noah building the ark, the ark during the flood, and Noah and his family and the animals coming out of the ark on dry land. Ask them to list as many animals as they can think of and discuss how noisy and smelly it must have been, and how hard they must have worked on the ark. God's plan to save us from sin has always been the cross of Jesus Christ, where we can be forgiven for anything we have done. Can you find the shadow of the cross? 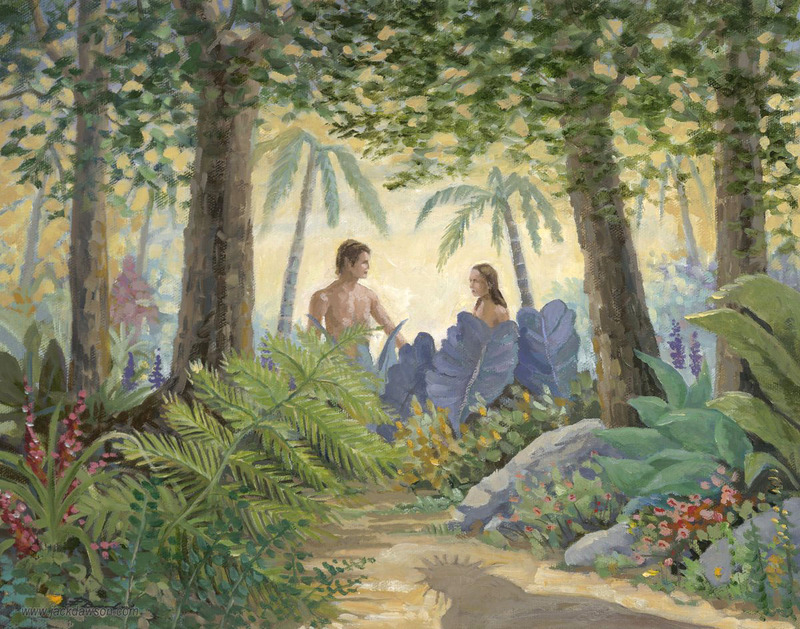 After Adam and Eve were banished from the Garden of Eden because of what had seemed a small sin, all generations to come would be under the curse of sin. 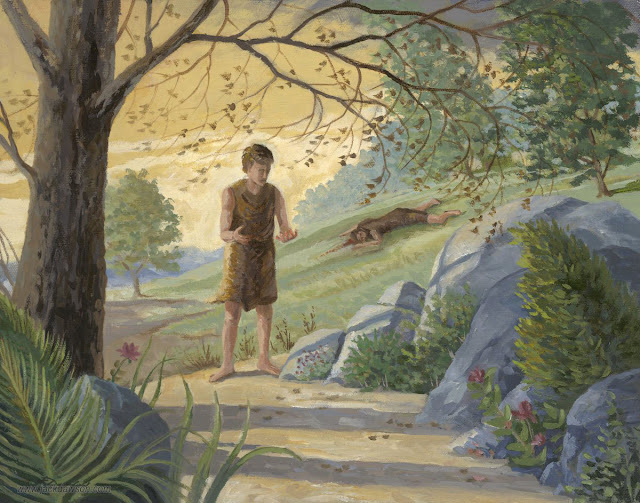 Cain and Abel, the first sons of Adam and Eve, were born with the same choice to obey or disobey God as their parents. Sadly, they made wrong choices, too. God knew their hearts, just like He knows ours, and after Cain murdered his brother, God drove him from His presence. We are all children of Adam. We all have the same sinful nature, and we are all driven from the presence of God. But He has a plan, and if we turn to Jesus Christ we will be forgiven. God, I know sometimes I do things for the wrong reasons. You know my heart better than I do. Please help me to see myself the way You do, and help me fix the things I need to change. Help me to be loving and kind to everyone I know. I love You and want to do things Your way. For discussion: Why did Cain murder Abel? Since we’re all under the curse of sin, can we help it if we do wrong? Do you ever think or say bad things about your brother or sister or friends? Are you glad God knows your heart? Why? Have the children secretly write out something nice they can do for their brother or sister (or other relative or friend if they have no siblings) during this Christmas season. Set a time to discuss what they did and how they believe God used it. The shadow of the Cross of Salvation is on the rock beside Cain. Adam and Eve had to leave the Garden of Eden because of their sin. 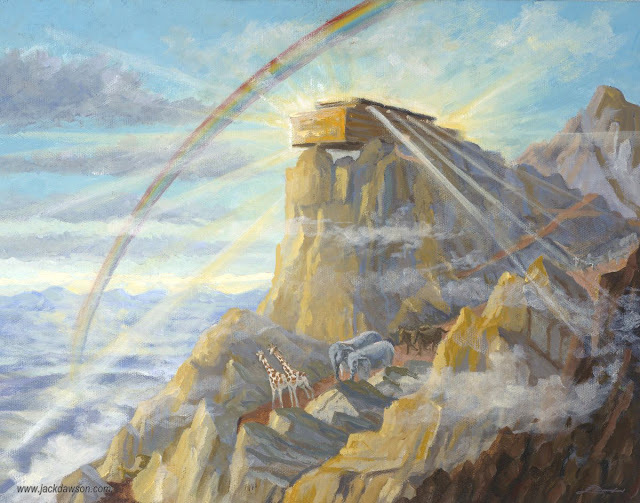 Can you find the word "sin" in the painting? God knew when He created Adam and Eve they would let Satan trick them into doing wrong and die, but He loved them anyway, and already had a plan to save them. They believed that eating the fruit would give them the knowledge of good and evil, like God. Do you think it’s sad they didn’t stop to think they already knew all about Good? How long do you think it was before they saw how awful it was to know about evil? How God’s heart must have hurt to have to drive them from the Garden He’d made just for them, even though He’d always known it would happen. Do you think He cried with them when they found out the garden they had chosen would be full of weeds and thorns and hard work and tears? Do you think they ever knew that because of their choice, everyone on earth would live with tears and hard things? The Good News is that “…God so loved the world that He gave His one and only Son, that whoever believes in Him will not perish, but have eternal life.” (John 3:16) He’s getting an even more wonderful place ready, where He plans to spend forever walking and talking with everyone who chooses Him. Lord Jesus, You are the only perfect One. Only You are good enough to pay for the sins of the world. Thank You for loving us enough to die so we can live forever with You. Help us to live so people want to know more about You. A – Admit you are a sinner and choose the wrong things. B – Believe Jesus died so you don’t have to die to pay for the wrong you choose. C – Choose to live for Jesus. God our Creator, thank You for loving us so much You want us to love You back with all our hearts. Thank You for giving us free choice. You knew when You gave it to Adam and Eve they would choose wrong and it would cost Your only Son’s life. Please forgive us when we choose the wrong thing and hurt Your heart. Help us remember to ask You for help to make the right choices, and to listen to You instead of Satan’s lies. Ask your children if they think the serpent was creepy and scary like snakes are now, or beautiful, like everything else in the Garden. 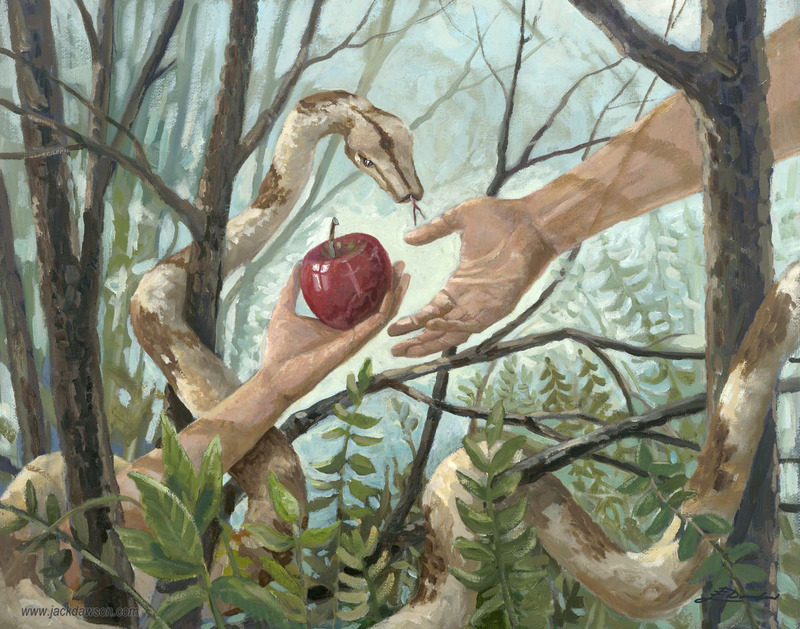 Discuss with them whether Eve disobeyed God because she was hungry, or because she believed the serpent when he said that she would "be like God." Discuss how she wanted to be like God and why that was wrong. 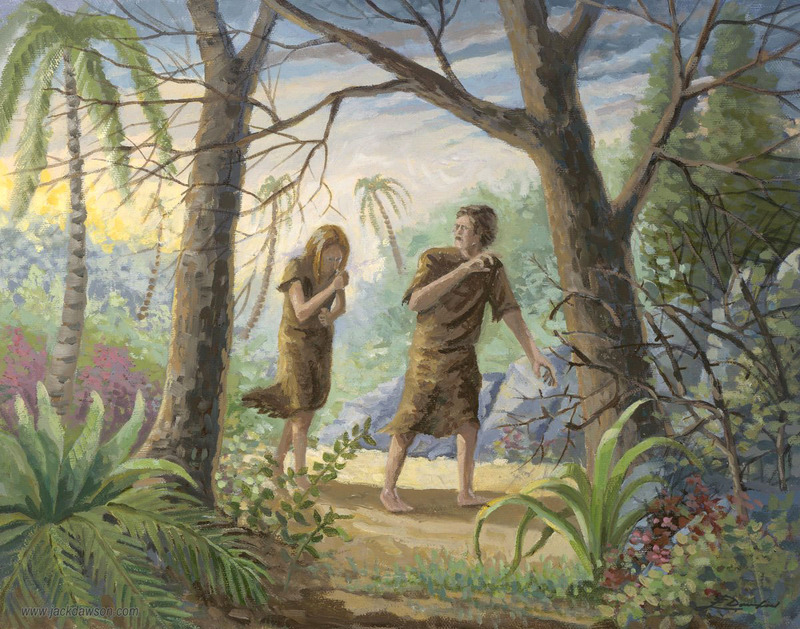 Discuss why Adam also made the wrong choice. Discuss ways that your children could be tempted to disobey and help them discover ways they can resist that temptation. Fun fact: The fruit is never called an "apple" in the Bible. 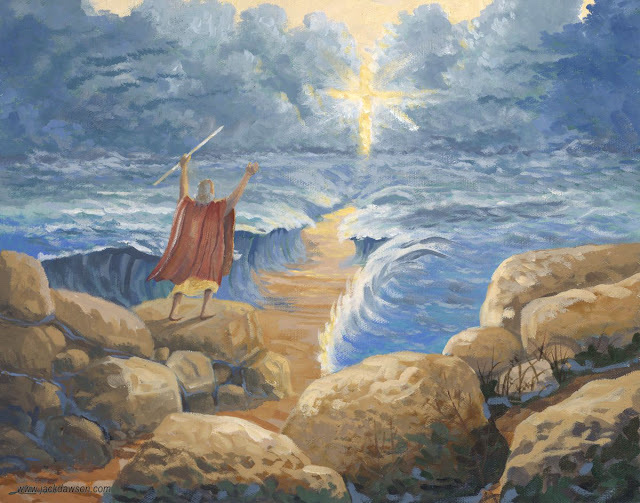 Can you find Jesus the Creator in this painting? God created the world and everything in it. He made it perfect in every way - a beautiful, quiet place for Him to walk in the Garden and enjoy His creation. Everything was made for His glory, from the endless universe so enormous you could never explore it to the single cell so tiny you could never see it. Does that word "glory" sound strange to you? Do you know what it means? God made His creation for His own pleasure, and to remind us that He is God, and we're not. Have you ever looked at the millions of stars in the sky on a dark, dark night and wondered where they came from? Have you ever looked at all the beautiful trees in the forest and thought that God surely is the greatest Artist there is? Psalm 19:1 says, "The heavens declare the glory of God; the skies proclaim the work of His hands." Father God, today we'll stop and remember that You are the Creator of everything. Thank You for giving us such a wonderful world. Thank You for using everything You've made to teach us about You. Please help us remember that everything is created for Your pleasure, to show us You are God. And please help us remember to always praise You for it. Set aside quiet time as a family to consider God's creation. On a clear, dark night, wrap up in a blanket with the children in the yard and study the stars. Ask them if they think everything they see could have "just happened." Take a walk in the woods. Have the children see how many different trees, flowers, mosses, grasses, animals, and other created things they can find. Talk about how beautiful and intricate even the simplest things they're seeing are. Ask if they think all this could be "just an accident." 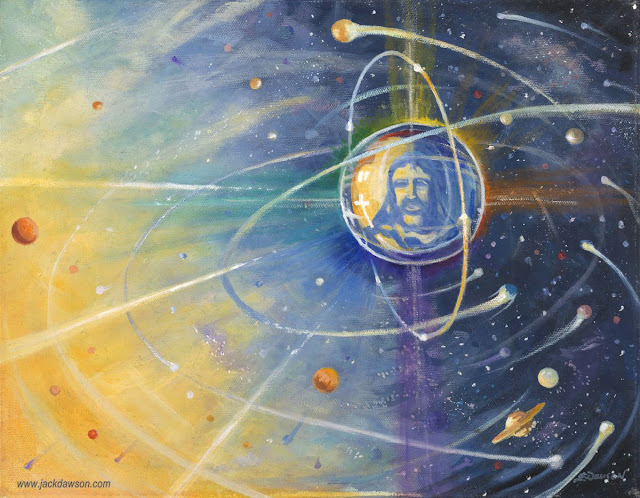 The face of Jesus the Creator covers all the earth.